“I’ve been fascinated by this process of birth and death. I was a midwife for seven years, delivering babies in the bush and it was always a great privilege and honor to be invited to a birth. I had many wonderful experiences there. One thing I remember about these births is the energy and excitement, the focus and attention at the moment the baby comes out. At that moment, the baby is often blue and it does not breathe for a few moments. Everybody in the room solemnly looks at this tiny creature and waits for it to breathe and all the adults in the room are holding their breath. I would then say to everyone, “Breathe! How is this poor little creature going to learn how to breathe if we are all holding our breath?” That precious moment seems like an eternity, when we are waiting for the baby to breathe and we need to bring that same attention and precious quality right here to our own breathing to give birth to ourselves, to our own child by night. Another thing I found about birthing which was quite addictive was this special quality of presence around birth, and usually when you really get into labor and are there for a while, all the things that don’t matter just fall away and it becomes a moment-to-moment experience. There’s a timeless quality about that energy. I went from delivering babies to spending time with people who are dying, and that same energy, that quality of presence is also true for people who are dying. That same energy is generated in meditation. And it wasn’t just by luck or chance, all those Zen stories where the ancient teachers just said one word and the student was enlightened. It’s the same as when you’re with a laboring woman, you stay with her through the night, you breathe with her, you can tell when the baby’s going to be born, you can tell the stages of labor easily when you’re a midwife. And it’s the same with those great Zen teachers. They know when the student is ripe. That one word can awaken the mind. There’s another beautiful analogy about form and emptiness that is very simple. It is like the wave and the ocean. 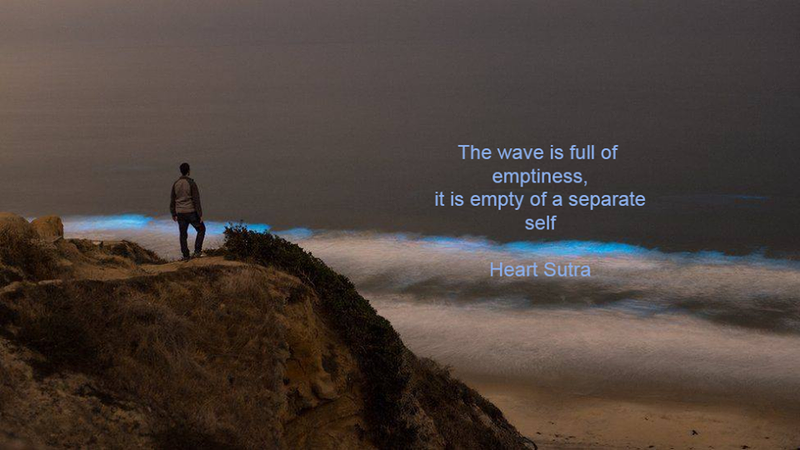 The wave has a beginning and an end, a birth and a death, and the Heart Sutra says that the wave is full of emptiness but is empty of a separate self. Now the wave is a form created by the wind and the water, but if the wave only sees its form, its beginning and end, it will be afraid of birth and death. But if the wave identifies with the water, with the essence, it will not be afraid of birth and death. The water is free from birth and death. Through the process of practice, we see there is an exclusive identification with our own body and mind, and this attachment to this body is our greatest limitation. I feel, I think, I am this, I hear, I, I, I. [But] when we meditate, we can experience the moment to moment impermanent nature of all the elements. We have the heat, the air, the water, thoughts and feelings. So what elements can you truly consider to be your own body if you truly look at it just as elements arising and passing away on a moment to moment level? Try and grasp hold of any one of those elements, try and hang onto one, just even one sensation in the body and say, “That is me”. It is impermanent. When we contemplate the body we can experience that microscopic level of that constant change and flux, bubbles, atoms. And we can experience this directly. Thanks to Nipun Metha of Awakin Weekly. About the Author: Subhana Barzaghi is a Zen roshi, residing in Australia.